Men: how can you strengthen your hair? Gentlemen, hair treatments are also designed for you. With our expert's advice, focus on the best regime to adopt to keep your hair in great condition long term! Use treatments which are rich in keratin. "Your hair is mainly made up of this protein. This kind of product is therefore perfect for strengthening your hair. Feel free to try the entire Keratin Therapy regime. The treatments from this range are a fool proof way to deeply regenerate your hair. Over weeks, your hair will become more resilient." "Washing your hair properly every 2-3 days is essential." 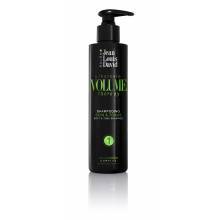 If you wish to add depth to your hair, opt for products from the Volume Therapy range. "These treatments are made from starch and fill the hair fibre, giving the impression of thicker hair. Finally, the last solution for taking care of your hair: steal your partner's products! As long as they are suitable for the nature of your hair of course!" At Jean Louis David, we don't offer anti-hair loss treatments. "Over the past few weeks have you noticed that your hair is thinning, you don't have the same density of hair or your hair is falling out more easily? Go for 'anti-ageing' products. Nowadays, science has developed effective hair treatments which slow down hair loss significantly." Our advice. If you notice you are losing considerable amounts of hair, you can also go to the pharmacy or see your doctor who will know how to direct you towards a targeted and personalised treatment.